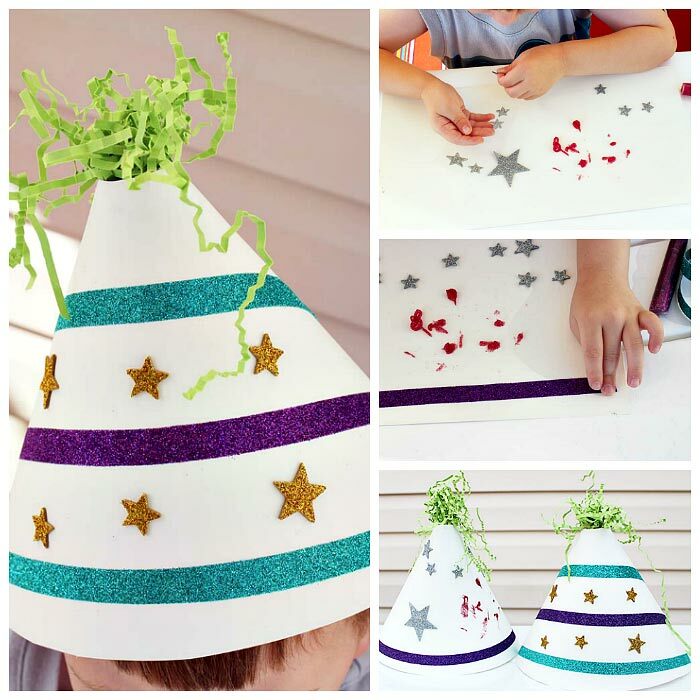 DIY party hats perfect for every occasion - makes a great kid's birthday party craft too. 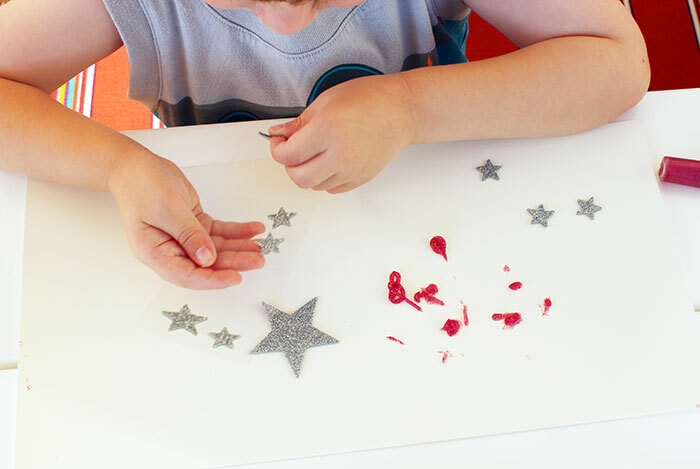 The beginning of July means two things for us - it's time for another Family Dinner Book Club craft and it's also time to start planning my twins' birthday party. 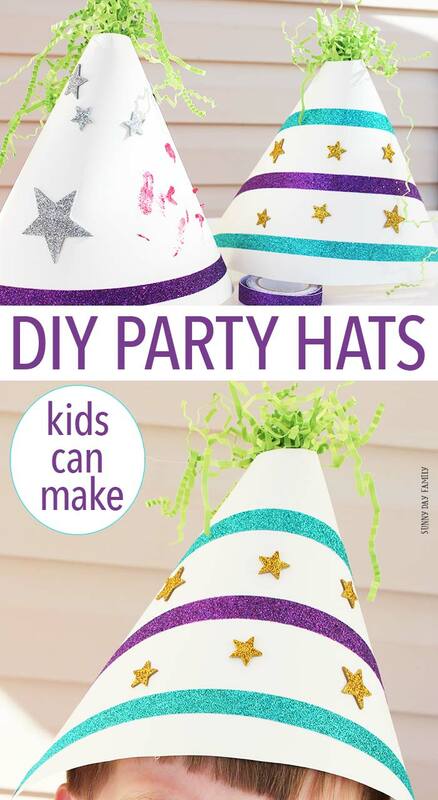 Fortunately, this month's book gives us a great opportunity for a fun craft that works for both - DIY party hats the whole family can make (and wear!). These super fun party hats are a perfect craft for this month's Family Dinner Book Club selection, The Children of Noisy Village by Astrid Lindgren. You probably know her as the author of the Pippi Longstocking books (some of my childhood favorites), and this one is equally charming. Family Dinner Book Club is one of my favorite projects, and it's an awesome way for families to connect with books. Every month, my cohosts and I give you everything you need for a family night centered around a book. Growing Book by Book brings you conversation starters and service projects, Chef Sarah Elizabeth gives you a mouth watering menu, and I give you a simple craft idea. This year, we are going "around the world" and each month's book features a different country. This month's book, The Children of Noisy Village, takes us to Sweden for a year in the lives of a group of children as they celebrate holidays and various customs of their village. One of the childrens' adventures is going crayfishing, and celebrating crayfish season is still a fun tradition in Sweden. Crayfish parties can be found throughout the summer, and no crayfish party is complete without fun party hats. So in honor of this tradition, we made our own DIY party hats. 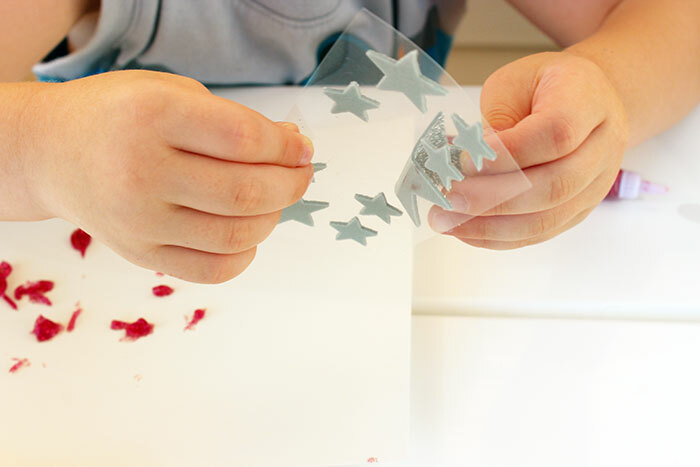 This craft is easy and fun for all ages! Here's what you need. 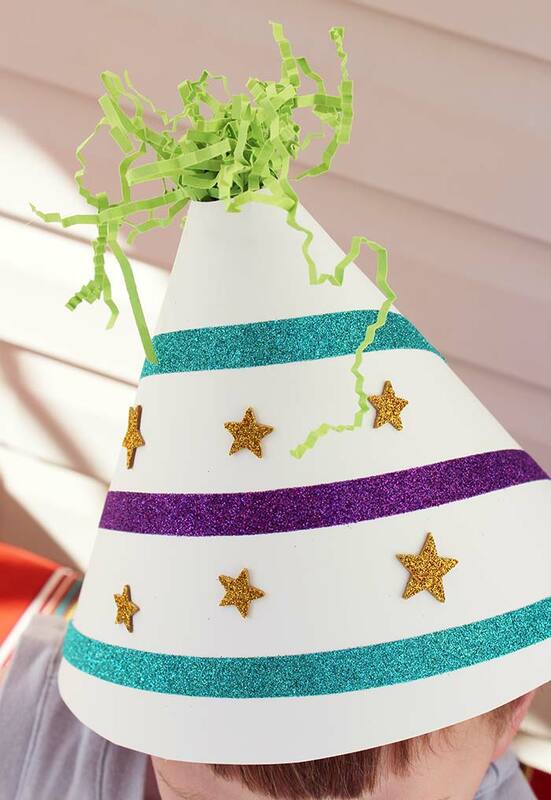 For each party hat, cut your posterboard into a 7x14 inch rectangle. This will make the hats large enough to be worn without an elastic under the chin (which my kids hate). 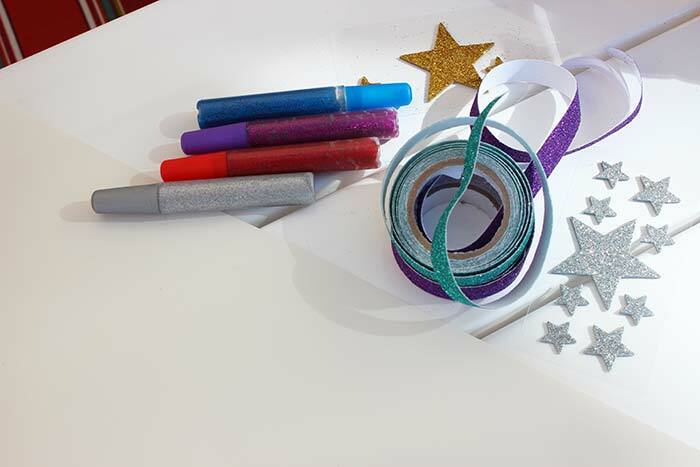 Lay out your rectangle and supplies and invite your kids to create their own party hats. My boys love stickers, so the stars were a big hit. 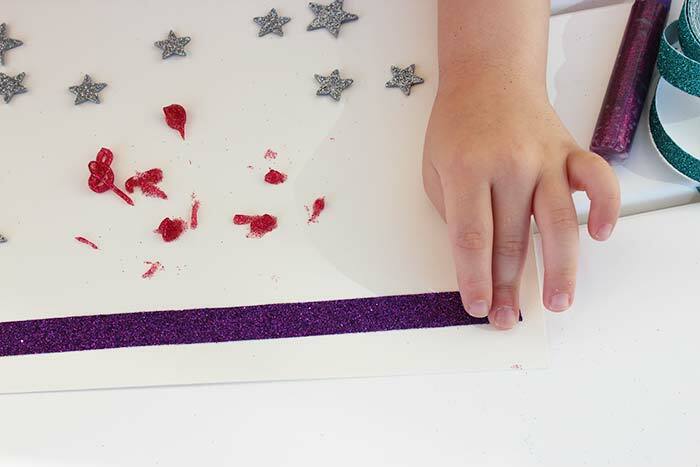 The glitter tape added a fun touch too, without all the mess of traditional glitter! 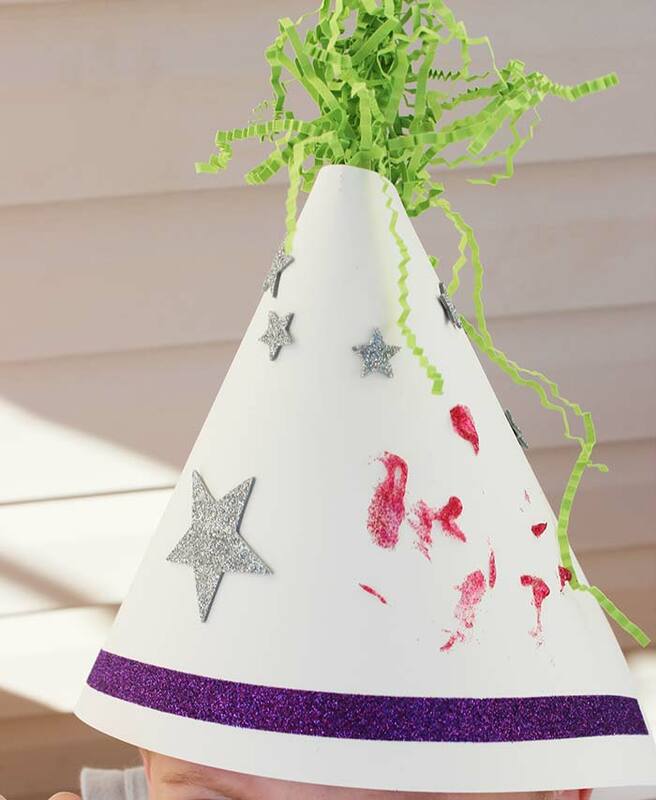 Once you are finished decorating, allow any glue to dry, then wrap your hat into a cone shape. Use clear tape to secure it closed. Add shredded paper to the top and secure it with tape on the inside of the hat. Now you're ready to party! PS - if you're planning a birthday party, be sure to grab my birthday party planner here! 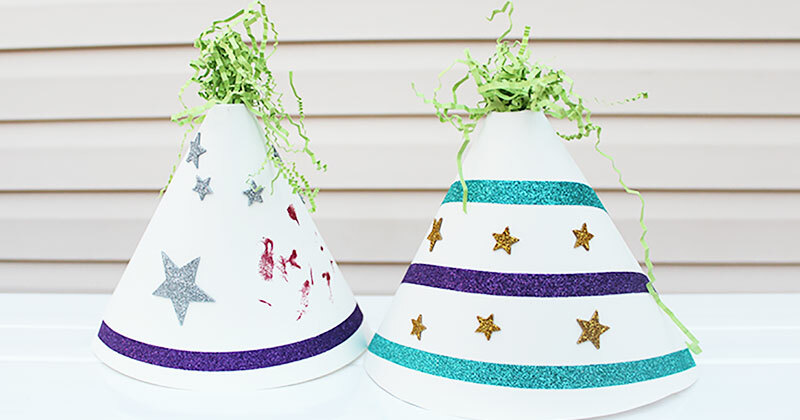 These DIY party hats are the perfect festive touch to your Family Dinner Book Club night, and also make a fun activity for any occasion that you want to celebrate. You can customize the colors and theme for your celebration - be creative and have fun! See the rest of this month's Family Dinner Book Club - a themed menu from Chef Sarah Elizabeth and conversation starters and service projects from Growing Book by Book. What a festive craft for our Family Dinner Book Club.